LG is all set to give HTC a run for its money, competing with it in the segment of smartphones with massive displays. Apart from decent configs, HTC is the clear winner in the market of smartphones with big displays and ‘SENSE’ual UI. 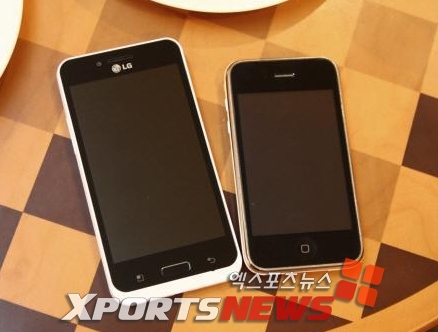 According to the latest rumor LG is already developing a phone codenamed “Optimus Big”. As evident from its name, the LG Optimus Big features a large 4.3 inch screen, single core 1 GHz processor, an integrated TV tuner alongwith LG’s sharp NOVA display. This smartphone will be joining the league of upcoming promising phones from LG. Some more features can be deducted if the leaked images are for real. It seems to be carrying a front facing camera for video chat/calling. The phone is supposed to come on LG U+ carrier in Korea next month. It is also very likely that LG Optimus Big will run a recent version of Android. No other information is currently available about this phone. But we sincerely hope that when it comes to the market it carries 4G capability and a dual-core processor. That would even compel iPhone owners to make a kill for it.